If you keep up with the events happening in your area or your city’s leisure guide, you may have noticed a trend making a stronger entrance: Creative Workshops! If you’ve always tapped into your creativity, perhaps you’ve attended these in the past; a watercolor paint class held in a room in a library or recreation centre, or maybe a photography class for beginners. But what seems to be the difference with today’s workshop trend is that it is all about the social setting, and self care. We feel that people are beginning to see and feel that being creative (even when they don’t feel as talented in the art) brings them joy, calm or fun! A popular workshop is “Paint Night”, for instance. Before the event, people sign up for the evening, based on their choice of sample painting. That day, the instructor brings all of the supplies; canvases, paint, paint brushes, trays, etc, and sets up for the workshop attendees. All they have to do is show up and listen to the step by step instructions of the instructor and they get to walk away with a piece of art that they created, and is likely much better than they even imagined they can do. Not only do they get to learn some great painting techniques, but many times, paint nights are held in a restaurant, so it’s a full night of creative, appetizers and beverages. Ask your friends to join, and make it a fun and satisfying night out! “I started learning calligraphy and watercolor a few years ago. Originally, I wanted to use these new skills to motivate myself to read the Bible and to make beautiful art for my home. Never did I think my new skills would lead to a business. As a self taught artist, I learned a lot by watching other people create their own art work. It wasn’t, however, until I decided to take workshops in person that I realized how important it is to learn directly from another artist. I learned how to avoid mistakes and to correct the issues made while practicing on my own, and most importantly I learned how to save money buying the right supplies. Workshops are a great investment – they’re fun, relaxing and will help you feel a great sense of accomplishment. 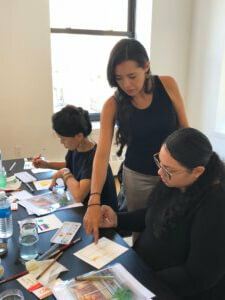 The excitement after finishing a workshop is a great motivation for you to begin your own art journey. The more I created, the more people started to notice my art and suddenly I had friends and family asking for custom orders and private classes. 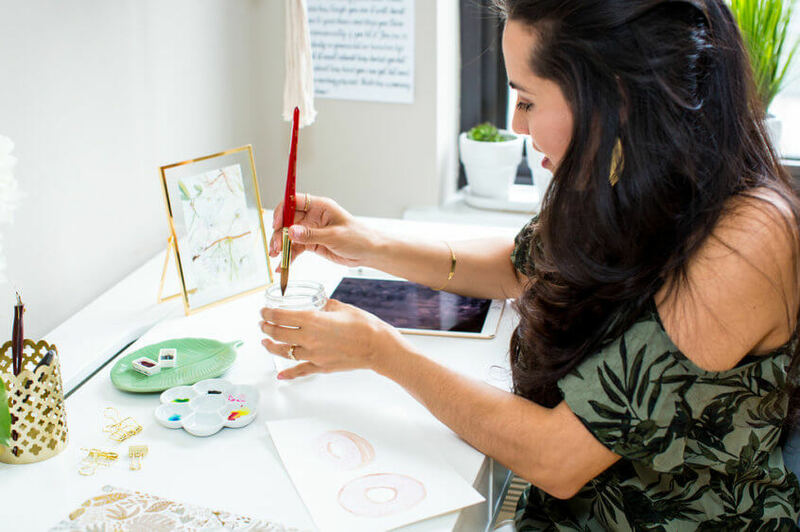 It wasn’t until my family and I moved to New York City in August 2017 that I took the opportunity to start my own creative business called “Prayer Craft Studio”. I immediately began receiving orders and by early 2018, I was able to launch my first workshop. 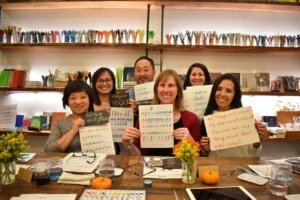 I hosted a broad pen modern calligraphy workshop for 30 ladies from my church and it was amazing. The adrenaline to teach increased and I started to promote my workshops on social media, especially on Instagram. So far, I have taught in the following groups and private workshops: Broad Pen Modern Calligraphy, Watercolor Lettering, Brush Pen Modern Calligraphy and Watercolor Urban Sketch. I even had an online Watercolor basics class with a lady in Panama. 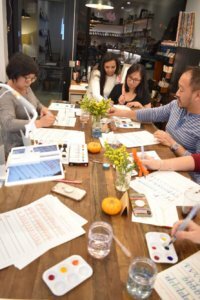 To host a workshop, it’s all about making the participants comfortable through the venue, the teaching tools and the art supplies. I personally like to use high quality materials, even for a beginners class, and I also use a projector to help the students see what my art in real time. We hope you find a workshop near you, we agree that it’s definitely worth it! Let the creative juices flow and we guarantee, you will be hooked!